Day 17. Sacred Space: Do you have a special place that you visit to be with your children? A place that you feel connected to? Maybe it is their grave, or a beautiful garden, beach, or forest. Maybe it is a special spot dedicated to them in your home. What does this place mean to you? Why that place? If you have't got a sacred place that you visit maybe have a think about finding a beautiful place or space to remember them. You could create one in your own home or garden. If you would like to create a space in your home or garden, put on some beautiful music, make yourself a cup of tea, and light a candle. Clear the space so it is clean and new. Think about what you would like to place in this space. Some ideas are fresh flowers, a candle, photographs, pieces of paper with your favorite quotes of poetry, an ornament that represents your child. The beauty about your space is that you can make it whatever you desire and it will grow, change, and evolve over time. It's a lovely idea to keep a photographic record of how it changes with your grief and life experience. I light a candle or some incense every morning and night in my space. My favorite sacred slace is Lily's special spot, located in my hometown of Crozet, Virginia. Her memorial stone was custom designed, just for her. It took 3 1/2 years to get her permanent stone, but it was worth the wait. It gave me time to think about what I truly wanted and how best to capture the story of Lily's life and legacy through her stone. Literally every single thing incorporated in her stone has deep meaning behind it. It does my heart good to have a place to visit and to be able to do something tangible for Lily, decorating her spot for different holidays and seasons. I like her spot to look as lovely as possible, in case she gets any visitors. :) I hope that when people see her stone, whether they know Lily and I or not, that they think her stone is beautiful and can tell how loved and missed she is. I hope they can just feel the love, the love I have for my precious daughter who I can only mother through things like designing her stone and tending to her special spot. I live in another state, so don't get to Lily's spot as often as I'd like, but I'm thankful that I have family and friends who take decor and tidy up at my request. We have gatherings at Lily's spot on special dates/occasions and to me, it's not morbid, as I'm sure others might think it is. To me, I don't think about what a cemetery is, I think about the beauty of having a stone to honor one's life. To have a stone, one must have existed. To have a stone means she is with Jesus and is still alive. A couple other sacred places are Lily's garden at my home, the hospital where she was born, the National Memorial for the Unborn in Chattanooga, Tennessee, where she has a brick paver, the beach, and mountains. 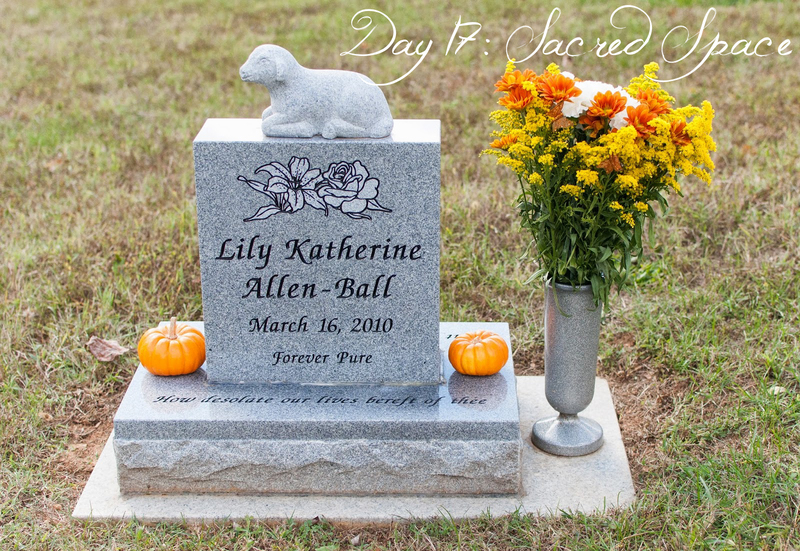 Click here to read all about Lily's stone. -Click here to see all of my photos from CYG 2016.